After the disappointment of Cora Cormack’s Losing It, I was somewhat hesitant to pick up another mistaken identity type novel particularly when the plotting was so similar. Damaged by H.M. Ward restored my faith. I consider myself the result of an somewhat accidental brain washing experiment. When I was 10 years old I spent a great deal of time one summer with an older cousin who was a rabid fan of the British rock group The Police, if you haven’t heard of them then this discussion is over. I credit my enduring love of The Police and to a certain extent General Hospital as a result of her machinations. 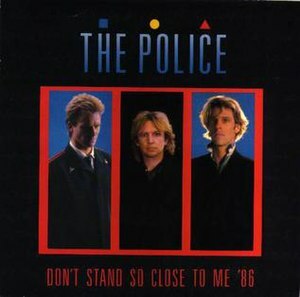 Their 1980 hit single Don’t Stand So Close to me features the relationship that develops between a female student and her teacher. Perhaps it is this song that influenced my love of this particular plot, I certainly never had an English teacher who looked like Sting though. Sidney Colleli is damaged, it is pretty obvious to the reader that she has been the victim of some sort of sexual assault. Despite her fears she agrees to go on a pseudo blind date with her friend. Thinking she has arrived before her friend she sits down at the table of a very attractive man mistaking him for the blind date in question. Peter Granz is new in town, tired of his own company he makes his way to a local restaurant when Sidney thinking he is her date strikes up a conversation and their attraction is immediate. Circumstances being what they are Sidney is recaptured by her real date and their interlude is ended. Until Sidney discovers the following day that she is his new TA. What elevates Damaged from Losing It primarily is the characterization. Sidney is a likable if closed off character who is actively trying to heal. Peter is also appealing there is a certain charisma about his character that comes through but then again who can resist a man who can dance? They both have secrets but their motivation is clear is clear to the reader. H.M. Ward has taken the time to build a relationship between her characters so there is no doubt what they see in one another. Without divulging the plot my only criticism would be the circumstances of the estrangement of Sidney from her family otherwise this was a strong addition to the New Adult genre and a compelling read.